If you're used to working with Excel on Windows, one of the most confusing aspects of using Excel on a Mac is shortcuts. Even basic shortcuts you've been using for years in Windows may not work as you expect. After a few problems, you might wind up thinking that Mac shortcuts are "totally different" or somehow "broken". In reality, Excel shortcuts on the Mac are quite capable, you just have to understand and adjust to certain differences. In this article, I'll walk you through the key differences you need to be aware of to work productively with Excel shortcuts on a Mac. One of more confusing aspects of keyboard shortcuts on the Mac are the symbols you'll see for certain keys. For example, the Command key is abbreviated as ⌘, the Control key with ⌃, and the option key as ⌥. These symbols have a long history on the Mac, and you'll find them in menus everywhere. You'll see these symbols in menus across all applications, so they're not specific to Excel. There really aren't too many symbols, so I recommend that you bite the bullet and memorize them. The table below shows some example shortcuts with a translation. Like their counterparts in the Windows world, Mac keyboards have function keys. These keys sit at the top of the keyboard and are labeled F1 to F12 on standard keyboards and F13, F14 and higher on extended keyboards. As you know, function keys are uses for many shortcuts in Excel. For example, you can use F1 for help, F7 for spelling, and shift + F3 to insert a function. But if you try these shortcuts directly on a Mac, they don't work. Why? By default, Function keys on a Mac control the computer itself, things like screen brightness, volume, video pause and play, and so on. This means that if press only the function keys in Excel, you'll end up controlling the Mac, and not Excel. If you really hate using the fn key, you can change this behavior by changing a preference at System Preferences > Keyboard. Here you can check a box that will that will change function key behavior to work like "standard function keys". If you do this, however, note that you won't be able to use function keys for things like Brightness, Volume, etc. unless you hold down the fn key. 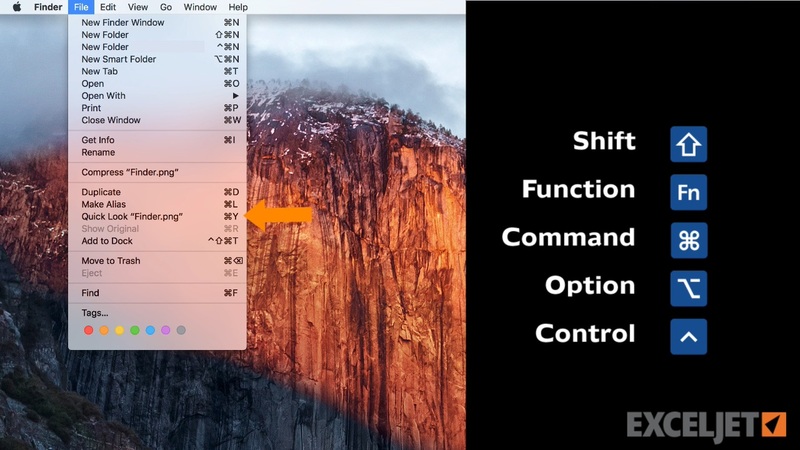 In essence, this setting reverses behavior so that you need to use fn to control the Mac. Personally, I like using the function keys to control the computer, so I leave this setting alone, and just the fn key when needed in Excel. Another difference that may trip you up on a Mac is certain keys are missing. Unless you're using an extended keyboard, keys like Home, End, backspace, Page up, and Page down are nowhere to be found. This is a problem, because many of these keys are used in Excel shortcuts. The solution is to use specific substitutions, as shown in the table below. The substitutions let you perform the same actions you can do in Windows. However, They can make some shortcuts seem complicated on a Mac because you have to use more keys. Note: If you're using an extended keyboard on a Mac, you don't need to worry about substitutions, since you'll have keys for Home, End, Page up, etc. In the world of shortcuts, perhaps the most painful difference on a Mac is a lack of ribbon shortcuts. In Excel on Windows, you can use so called accelerator keys to access almost every command in Excel using only your keyboard. This doesn't matter much when you're performing an action that has a dedicated shortcut (i.e. Control + B for bold), since dedicated shortcuts are faster than ribbon shortcuts. But when you want to trigger an action that doesn't have a dedicated shortcut (like sort, hide gridlines, align text, etc. ), it hurts a bit. Excel ribbon in Windows with accelerator keys visible. No equivalent on the Mac! Finally, some Excel shortcuts are just plain different on a Mac. For example, the shortcut for Edit Cell in Windows is F2, and on a Mac, it's Control + U. The shortcut to toggle absolute and relative references is F4 in Windows, while on a Mac, its Command T. For a complete list of Windows and Mac shortcuts, see our side-by-side list. If you want to see more Excel shortcuts for the Mac in action, see our our video tips. These videos come from our video training. Whenever we use a shortcut, we show both the Windows and Mac version. With the introduction of Excel 2016 on the Mac, Microsoft has started to adjust Mac shortcuts to be more aligned with Windows. As of February 2016, many Windows shortcuts can be used in Excel 2016/Office 365. For example, you can use fn + F4 to toggle between absolute and relative references, Control + Shift + L to toggle a filter on and off, etc. So far, all the shortcuts that have been adjusted to match Windows shortcuts remain backward compatible with previous Mac only shortcuts. For example while fn F4 toggles references on the Mac, the old shortcut Command + T still works as well.